The first level of the Moose Hollow Lodge features a full level of fun that is guaranteed to keep you entertained throughout your vacation! The game room contains everything from a professional-style pool table to a 9-foot air hockey table, as well as arcade games such as Ms. Pac Man, Galaga, Alien Invasion and Cruisin Exotica. Watch your favorite sports team in action on one of the two televisions and open the blinds to reveal stunning views of the Smoky Mountains! As if this wasn’t enough, the first level also contains Pigeon Forge’s only rumble seat theater! This state-of-the-art home theater features a massive screen, surround sound and high-definition viewing for your favorite DVD and Blu-Ray movies. You will also find three bedrooms on this floor, which are perfect for those who want to be close to all these fun amenities! 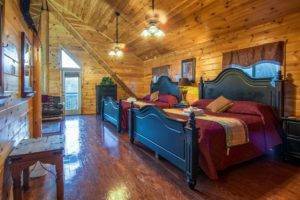 The second level of our group cabin in Pigeon Forge offers tons of living space to relax with your family and friends! 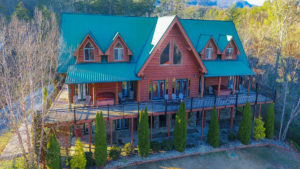 The huge outdoor deck wraps around all four sides of the Moose Hollow Lodge and is where you will find two large 5-person hot tubs, 12 rocking chairs and beautiful Smoky Mountain views. 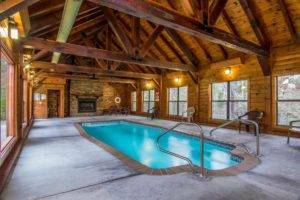 The deck also provides access to the pool house, which is just 150 feet away with a heated indoor swimming pool! If you prefer to kick back indoors, the second level also features a comfortable loft area and a living room with a gas fireplace. One of the highlights of this level is the magnificent gourmet kitchen, which contains everything you need for efficient meal preparation throughout your vacation! The second level also contains four lovely bedrooms where you can enjoy a wonderful night of sleep. The third level of the Moose Hollow Lodge features two large master suites, each of which contains 3 king-size beds and two televisions with hundreds of channels! 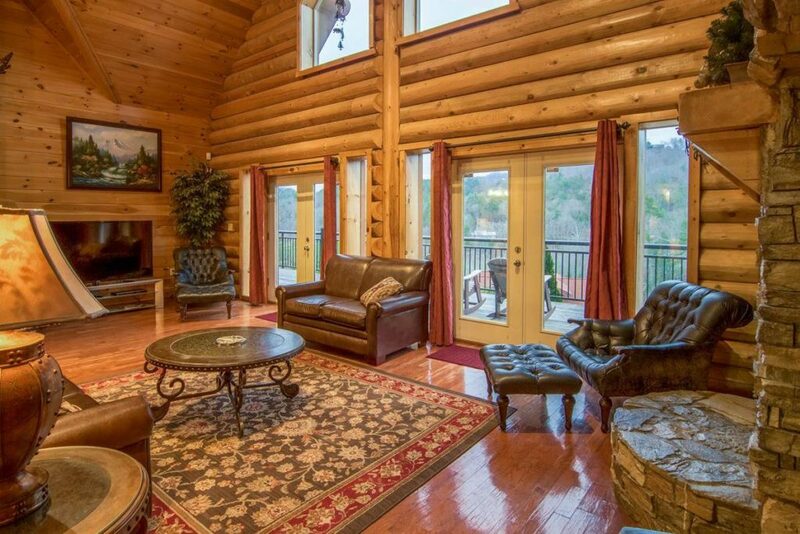 These suites also have access to a private deck area where you can appreciate fresh mountain air and the peaceful ambiance of the Smokies. As if that doesn’t sound good enough, each suite also has a huge soaking tub with relaxing massage jets! The other section of the third level contains a loft with furnished seating for 15 guests. This is the perfect place to hang out with your friends as you play a board game or talk about your adventures in Pigeon Forge! 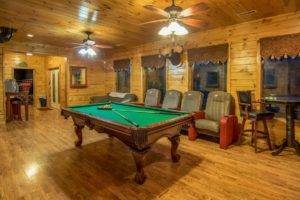 Now that you have learned about each level of the Moose Hollow Lodge, reserve our group cabin in Pigeon Forge today to experience the lodge for yourself! We look forward to seeing you soon! My wife and I had our wedding here and it was incredible. It is worth every dollar to have this great space. The lodge sleeps over 50 people, but we only had about 25 so we all had more room. The hot tubs, pool, wrap around deck, movie theatre, and game room ensured everyone always had something to do. The common areas are so abundant that people had plenty of room to relax and spread out. Most of the lodges around here are crammed in near other places, but this one is out of the way and much more peaceful. The views are great, and the location is still really close to town. Thank you for a great time and a beautiful setting for our wedding!